Ainsley has a great laugh! She used to just giggle but now she has that fun laugh where she cackles and shrieks. It is the sweetest sound in the world! I just wish I could capture it on video. She becomes so enthralled with the camera that she won't laugh! 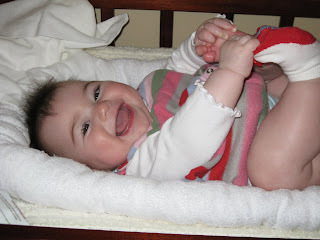 Here is a cute picture of her on the changing table which is her favorite place to laugh and talk to us. Yea! I am so glad you started a blog! It looks great!